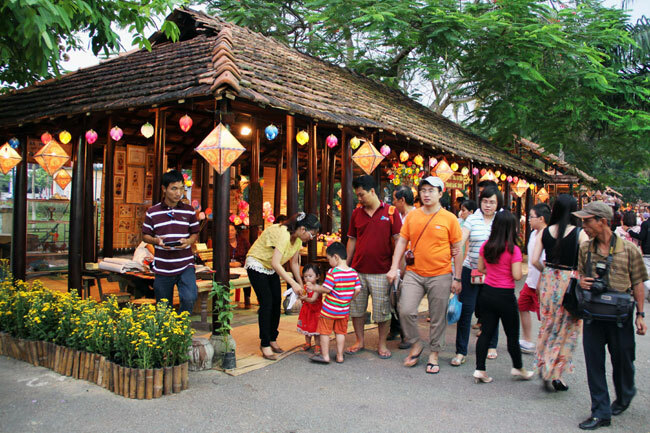 THUA THIEN-HUE (VNS)— A night market will be organised during the up-coming Hue Festival 2014, the biennial cultural event, which is scheduled to take place on April 12 in the former capital city of Hue. The market will feature stands and stores displaying authentic Hue dishes and traditional craft products for luring more visitors to stay back in the city at night, according to Ngo Anh Tuan, the deputy chairman of the city People's Committee. The dishes in the offering will be bun bo (Hue-style spicy beef noodles), com hen (rice with mussels), banh khoai (fried rice crepes), and various types of che (sweet pudding). Craft products of enamel, wood carving, bronze casting, conical hat, handmade embroidery, and bamboo and rattan knitting will also be on display. The visitors will be able to explore the local culture through live traditional music performances, folk games, and the local artisans will also demonstrate craft techniques and authentic culinary skills at the market. The organisers also provide traditional medical check-ups and herbal medicinal services aimed at offering an insight into the medical system that was available to the royal families in the past. The night market will have a trial run during the event, and a decision will be taken for its permanent location based on the success of the event. The market will occupy the open spaces next to the fencing walls of the former Royal Palace, comprising three of its sides, including west, north, and east. The eastern side will be illuminated with hundreds of lanterns. All vehicles will be banned on the streets that border the market areas, and only pedestrians will be allowed to access the area. Earlier, the city authorities set up a night market on a pedestrian street along the poetic Perfume River and leased it to a private company. The locals became furious as the market had become as messy as a flea market, selling cheap Chinese products, instead of the local specialties and craft products.